The Vršič Pass, a winding mountain road built by Russian prisoners during World War I, stood between Kranjska Gora and our next destination: the mountain town of Bovec. The 1,611 meter mountain pass was significant at the time of its construction due to its proximity to an important frontline in the war. It allowed a constant flow of supplies to the Isonzo Front for the Austro-Hungarian army. On our way up the mountain we encountered The Russian Chapel; a Russian Orthodox church built by POW's that survived a 1916 avalanche at the site. It stands in memory of their 300+ comrades who perished tragically in the accident. The site was jointly renovated in 2005 by the Slovenian-Russian Society and the Municipality of Kranjska Gora, and serves as both a war memorial and a symbolic link between the improved Slovenia and Russia inter-state relations. At the bottom end of the Vršič Pass in the Soca Valley, the town of Bovec sits surrounded by stunning peaks of the Julian Alps. 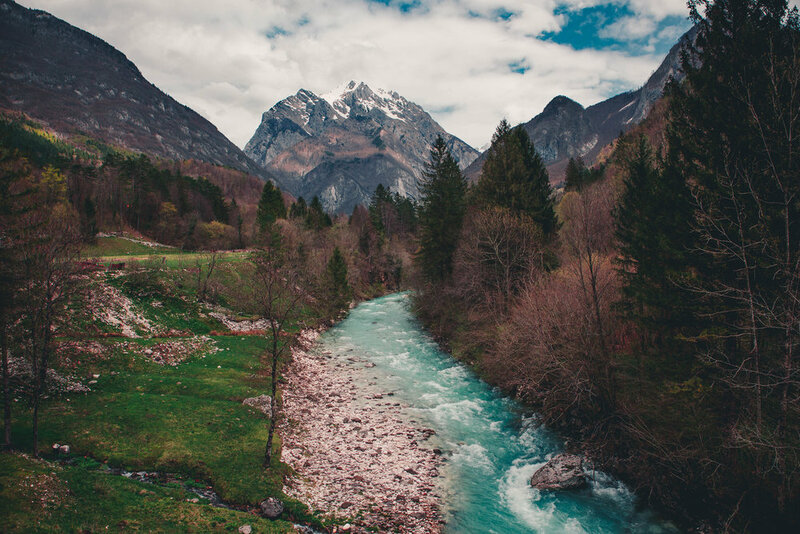 Like the rest of the region, it is a hot spot for hiking and outdoor activities of all kinds, including rafting on the Soča River. The alpine waterway is beautiful; impossibly clear with a tint of turquoise color. We spent the afternoon visiting various waterfalls and trails around the area. This scene is a quintessential view of the valley, and was taken from one of the overlooks on a trail that leads up a mountain toward Slap Boka: one of the mightiest waterfalls in the country.